"They had a date with fate in Casablanca!" Casablanca is a film that has certainly stood the test of time. The song "As Time Goes By" played in the movie is still frequently heard today. Over half a decade after it was made, many people may not even realize that the sayings "Play it again Sam", "Here's lookin' at you kid", or "of all the gin joints in all the world, she has to walk into mine!" are from this black and white classic. With a star studded cast including Claude Rains, Humphrey Bogart and Ingrid Bergman, Casablanca was filmed during the Nazi invasion of Europe during the second world war. The story follows Rick, a nightclub owner living in a town called Casablanca on the Moroccan coast. 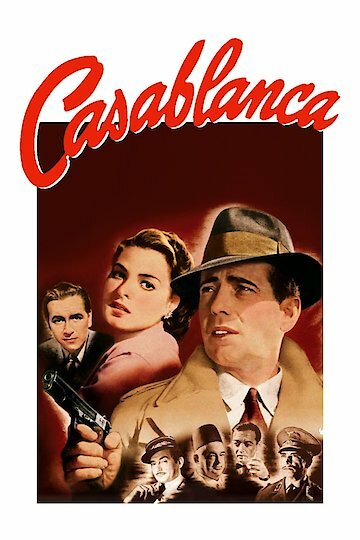 In the film, Casablanca was a place where people who were trying to escape the oppression in Europe would gather in hopes of gaining passage to America. Rick claims to simply want to live and let live, claiming he never takes sides during times of conflict but is shown to be something of a patriot at heart--often subtly rooting for the downtrodden. Rick's nightclub is shown to play host to patrons from all sides of the conflict; from French and Nazi officials to the refugees who are trying to escape their tyranny. Rick's life becomes slightly more complicated when an acquaintance of his leaves valuable documents in his possession. Documents that are highly sought after because they offer something that most in Casablanca are dying to get their hands on: transit papers to leave the country for the United States. Shortly after hiding these papers, Rick's acquaintance is captured and killed for the papers which he no longer has. Before Rick really has time to digest what is happening, his life is turned upside down yet again when he runs into his former lover Ilsa--alongside her husband Victor. Victor is a leader in the underground movement against the Nazi regime and the couple is desperate to get out of the country to safety. Ilsa hears rumors that Rick of all people may have the means to help she and her husband escape. Rick must face his past and discover his own loyalties to determine if he is really going to help Ilsa and Victor escape. Casablanca is currently available to watch and stream, buy on demand at Amazon, Vudu, Google Play, FandangoNow, iTunes, YouTube VOD online. Want to catch up on a classic? Warner Bros. is screening "Casablanca" on Facebook this week, for free. Yep, one of the best movies of all time, for free, on your computer. Find out how to watch here. Movies become classics because they stand the test of time. Something either in the plots, or in the characters, strikes a chord with movie-goers. As a result they stay in people’s hearts and minds long after their images have left the silver screen. Here are only three out of hundreds of classics that have helped to shape the cinematic landscape. Citizen Kane – This film almost always makes critics’ top ten lists for best movies of all time.